dpa/NAN, Abuja; Legendary US golfer Arnold Palmer died on Sunday in Pittsburgh, Pennsylvania, aged 87, the US Golf Association confirmed. Palmer died at the UPMC Presbyterian Hospital in Pittsburgh, where he had been undergoing heart tests since Thursday, the Pittsburgh Post-Gazette reported. Fondly known as “The King,” Palmer won seven major championships during his playing career, which began in the 1950s, and was one of 13 original inductees to the World Golf Hall of Fame in 1974. “He took the game from one level to a higher level, virtually by himself,” Nicklaus wrote in a statement on Twitter of one of his closest friends. Palmer, born on September 10, 1929, in Youngstown, Pennsylvania, was taught to play golf by his father who was the head pro and greenskeeper at the country club that was next door to the family house. By 1967, Palmer became the first golfer to earn 1 million dollars in tour prize money. Palmer attracted a devoted legion of fans called “Arnie’s Army” through his magnificent performances on the golf links, his magnetic personality and his sense of kindness and thoughtfulness. He never won golf’s fourth Major, the PGA Championships, but did notch three second-placed finishes. Palmer said goodbye to the US Open, which he won in 1960, at Oakmont in 1994, and from the British Open – where he was a two-time winner – at St Andrews in 1995. 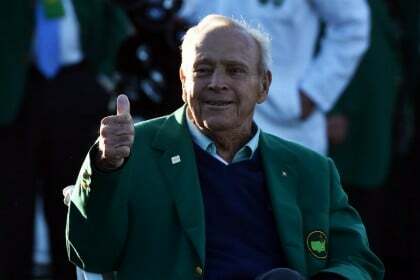 In 2002, Palmer played his 147th and final round on the illustrious links of the Augusta National, where he claimed four Masters championships. “I just think it’s time. My golf has been pretty lousy of late, and it doesn’t warrant being here playing,” the then 72-year-old Palmer told reporters after shooting a 17-over 89 in the first round – matching his worst score ever in 48 appearances. “I’m not any different than most people,” Palmer, the Masters winner in 1958, 1960, 1962 and 1964, said at the time. Palmer remained highly involved in golf after retiring, presiding over the annual Arnold Palmer Invitational, the only living player with his name attached to a PGA Tour event, Golfweek said. He received the two highest civilian honours in the United States – the Congressional Gold Medal in 2012 and the Presidential Medal of Freedom in 2004. Palmer was also seen as an excellent businessman, a prominent advertising spokesman, a skilled aviator and a talented golf course designer. His health had been in decline since late 2015, Golfweek reported, and a ceremonial tee shot at that year’s British Open was his last public golf shot.